By trying to make music available to everyone, Pizzicato has developed many aspects of music education. Whether for music theory, music notation, music reading or creative music composition, Pizzicato has developed itself into a large field of experimentation, like a music laboratory where you can combine many tools taken from a multi use toolbox. The range of the Pizzicato music education software has been developed since the beginning with the idea that the user would not necessarily need to master music before using the software. This is why a music theory course can be found in the user’s guide, explaining the basics of music notation with practical examples. This course uses images and musical examples that the user can play to understand what are a staff, a clef, a note, an accidental, a rhythm as well as most aspects of music notation, including scales and chords. For this reason, Pizzicato is an ideal music education software for students who start learning the basics of music. Understanding of music notation goes hand in glove with practise. Pizzicato helps the student to apply what he has learned. By using the various notation tools of Pizzicato (entering notes, rhythms, changing clef, time and key signatures,…) the student can fill in the content of measures and experiment the link between what is written and what he hears. By alternating the music theory lessons and the lessons about using the basic notation tools, the student can master all aspects of music notation. It is indeed the purpose of a music education software. In the course of learning to read a music score for singing or for instrumental performance, a music education software helps to give a rhythmic and a pitch reference to the student, through the playback of the score by the computer. It is a very useful feature to avoid that the student gets into the habit of an error while practicing at home between his lessons. 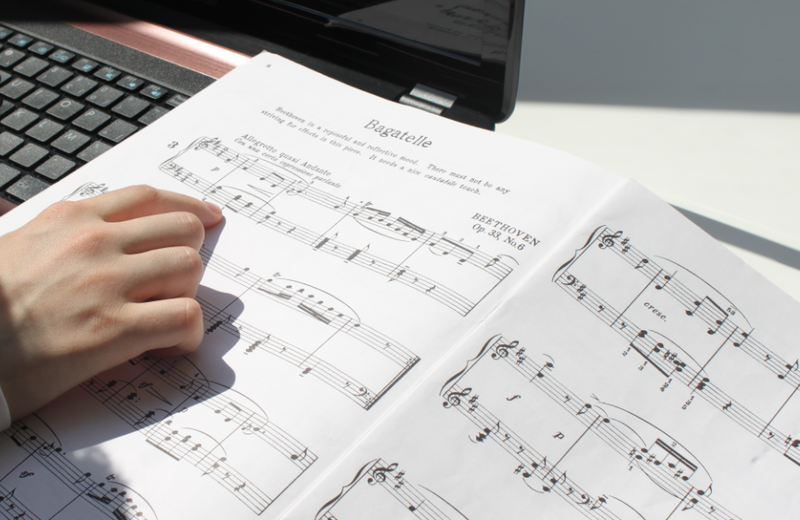 By singing or playing the score together with the computer, the student will be able to easily locate any rhythmic or pitch error and immediately correct it. Without that, he would continue playing the error until his next lesson when his teacher would correct him. With the help of a music education software like Pizzicato for pitch and rhythm, the student can easily work at home and the teacher can work on the most important aspects during the lessons, like the instrumental technique, the life and performance of the music, which a computer would not be able to do. Pizzicato becomes an assistant to both the teacher and the student. Beyond writing and reading a musical score, there is the understanding of music itself. Any serious approach to music education should take into account the innate creative ability of the human being and give him the means to develop it and express it. Once the basics of understanding the musical language have been established, the subjets of arrangement and creative music composition can be addressed. The major advantage is that Pizzicato has been developed with the purpose of helping users to compose music through many intuitive tools. Unlike many other similar software, Pizzicato has specialized in the development of many composition tools, while still remaining a music education software structured around traditional music notation. The student and the teacher will be able to use tools to structure a music composition and to handle and experiment with chord progressions, melodies, rhythmic structures as well as harmony and counterpoint rules so as to build a solid harmonic and melodic structure that may then be worked in any music style. Other Pizzicato tools also provide creativity with sounds and the integration of audio files for direct playback and recording of voice or musical instruments. Creativity is the main purpose. Let us stimulate it and help students to express themselves and build their own music compositions. With Pizzicato, teachers have a real musical laboratory for experimentation with their students. This creative music laboratory can easily be integrated with other music notation software like Finale or Sibelius or with audio/MIDI sequencers like CuBase or Logic, through MusicXML and/or MIDI file exchange between these software and Pizzicato. If you want to discover precisely all advantages and special Lab packs for music associations, educators and students, please visit page http://www.arpegemusic.com/music-education-software.htm. We will also inform you quickly by phone at +32 87 55 23 60 or at +32 87 26 80 10 and by mail at support@arpegemusic.com.